Exercise Bike or Rowing Machine: Which is Better? 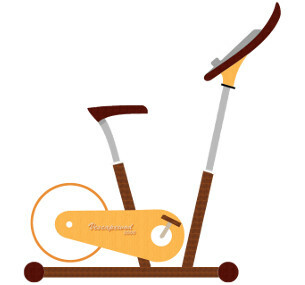 You hesitate between a rower and a stationary bike and don't know which one to choose? The rower seems more demanding, is it however more efficient than the exercise bike to lose weight? What about muscle building? And to strengthen your thighs, buttocks and legs? Isn't the rower contraindicated when you have knee or back problems? To help you make the right choice, read our comparison and discover the differences, pros and cons of the stationary bike compared to the rowing machine! 1) Exercise Bike or Rowing Machine for Weight Loss? The two fitness machines, the stationary bike and the rowing machine, offer an efficient cardio workout to burn calories (and fat!). Both machines offer the advantage of being able to vary the intensity of the workout by increasing the machine's resistance and thus burn more calories. 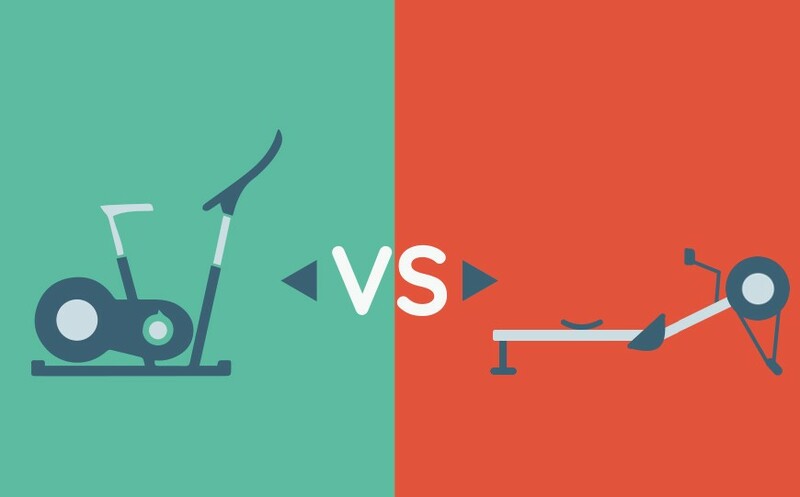 Rowing machine vs. exercise bike: which fitness machine burns the most calories? The rowing machine and the exercise bike allow you to burn the same amount of calories. The two machines are indeed based on the same principle: you make a wheel rotate with the strength of your legs (and your arms for the rower). As shown in the comparison table above, the calories burned depend on how long you work out and how hard you exercise. For example, you will burn about 800 kilocalories in one hour of intensive training on a rowing machine or a stationary bike, but only 400 kilocalories if you do a more moderate workout. But isn't the home exercise bike more effective than the rowing machine at losing weight? Indeed, even if they can help you to burn as many calories, there is a big difference! It is much easier to exercise for 30 minutes, 45 minutes, 1 hour or even 2 hours on a stationary bike than on a rowing machine! A workout on a rower usually lasts 20 minutes, while an exercise bike workout session lasts at least 30 to 45 minutes. The rowing machine is more demanding because of the position, the significant knee bending and the movement in two steps (or even 4) which induces a great effort and then a slackening in order to make the wheel turn while the movements on the exercise bike are constant and the position comfortable and not demanding. If your main goal is to lose weight, then we would recommend you to opt for an exercise bike because you can easily alternate between extended cardio workouts of one hour or more and 20-minute HIIT workouts to burn calories and fat efficiently (see How to lose weight on a stationary bike). Lose 1 kg per month. 1 hour of exercise bike 3 times a week allows you to lose 1 kg per month or you can achieve the same by doing 30 minutes of rowing 3 times a week for 2 months. 2) Stationary bike vs rowing machine: Which muscles are used? The exercise bike and the rower are cardio fitness machines, i. e. they work out the body's most important muscle, the heart! In addition, they help to firm muscles, to refine them but not to make them swell as weight lifting would do. The second common advantage of the rower and the stationary bike is that they will both help you to strengthen your legs, your thighs and your buttocks muscles. If you want to lose weight, it is essential to work on your muscles in order to firm up the softest parts of your body and have a more athletic body. The advantage of the rowing machine over the stationary bike is that it works the muscles of the arms, shoulders, back and abdomen, while the exercise bike essentially works the muscles of the lower body. Is the rowing machine more efficient than the exercise bike to strengthen the thighs? Both fitness machines are effective for strengthening the thighs. They both make it possible to increase resistance in order to make the thigh muscles work harder because the higher the resistance, the more the muscles work! However, the exercise bike mainly works the leg and thigh muscles, which means that your effort is concentrated on this part of the body. If you tire out your arms after 20 minutes on the rowing machine, then training stops, whereas on the home bike, it is mainly the legs and thighs that work and if you can extend the training to 45 minutes, for example, this means that you save 25 minutes compared to the rowing machine and you will have done more work on your leg and thigh muscles. WHAT YOU NEED TO KNOW. Muscles don't come without effort! It will be necessary to increase the resistance of your home stationary bike or rowing machine if you want to work out your muscles and tone them up! The advantage is that you will burn more calories at the same time! 3) Exercise bike or rowing machine when you have knee or back problems? The stationary bike puts little strain on the back and therefore presents no problems for the back. In addition, the exercise bike makes it possible to work the knees very gently when pedalling with moderate resistance and is thus suitable for both prevention and rehabilitation after knee surgery. It is an ideal fitness machine for rehabilitation because it does not cause any knocks to the joints. The rowing machine is very demanding for the back. In a sense, it strengthens the back, but on the other hand, for people who already have back pain or not a good posture, the intensive use of the rowing machine may increase the pain. In addition, the rowing machine forces you to bend the knees completely, which is generally contraindicated for people with knee problems. The exercise bike is therefore more suitable for the elderly and people with back or knee problems than the rowing machine (see our article about the exercise bike against back problems). WHAT YOU NEED TO KNOW. You must have the right technique when training on a rowing machine to avoid back pain! Push with your legs first, then slide the seat backwards and lastly pull with your arms, then repeat the other way round (extend your arms, slide the seat and then bend your legs). 4) What are the other pros and cons of the exercise bike and the rowing machine? The rowing machine and the stationary bike are cardio machines that offer benefits for the heart and the cardiovascular system, improve physical fitness and endurance, allow you to lose weight and strengthen your legs, thighs and buttocks. However, the two machines correspond to two very different types of use which we present in the table below. • Requires experience to get the right movement and position. Generally speaking, the exercise bike is suitable for almost any type of use, whether it is to stay in shape, for weight loss, rehabilitation, prevention or to tone up the muscles of the thighs, legs and buttocks. Amateur or professional cyclists will prefer a spinning bike, a home trainer or a semi-professional stationary bike, whereas if you want to exercise for 30 minutes to 2 hours a day, a home stationary bike is the perfect choice, such as the DKN AM-3i for example. People who are accustomed to rowing will appreciate the paddler in order to feel the sensations they know and continue training at home in bad weather while measuring their performance. Don't forget that you should ideally work out 30 to 45 minutes on your exercise bike or rowing machine 2 to 3 times a week. This is how you can fully enjoy the benefits and positive effects of exercise on your body and your health! David Anderson is a professional writer with 15 years of experience in the sports and fitness industry. He has been writing about fitness and giving workout tips and advice for the Vescape Fitness Shop since 2016.